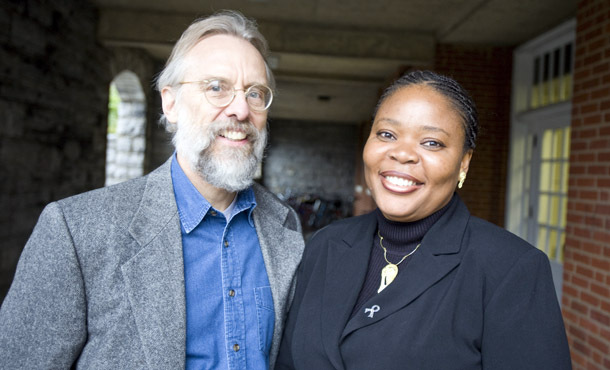 Pictured with Barry Hart (left), Leymah Gbowee was one of three women chosen by the Norwegian Nobel Committee for the Nobel Peace Prize. Hart is academic director of EMU's Center for Justice and Peacebuilding. One of the three women receiving the 2011 Nobel Peace Prize, Leymah Gbowee, is closely connected with the “peace-church tradition” of the Mennonites. Gbowee, who shares the prize with Liberian President Ellen Johnson Sirleaf and women’s rights activist Tawakkul Karman of Yemen, earned a master’s degree in conflict transformation from the Center for Justice and Peacebuilding (CJP) at Eastern Mennonite University (EMU) in Harrisonburg, Virginia. She attended CJP’s Summer Peacebuilding Institute in 2004 and participated in a round-table for Strategies for Trauma Awareness and Resilience (known as “STAR”) in 2005. EMU’s Center for Justice and Peacebuilding (CJP) was one of the first university graduate programs in conflict and peacebuilding field. CJP’s Summer Peacebuilding Institute, the first of its kind, has become a model for other peacebuilding institutions around the world. Gbowee led a nationwide women’s movement that was instrumental in halting Liberia’s second civil war in 2003. Gbowee’s links to Mennonites began in 1998, when she received training in “trauma healing and reconciliation” and then worked at rehabilitating child soldiers. Perhaps unbeknownst to her, the first trainings in this subject in Liberia occurred when Barry Hart, a Mennonite with trauma expertise, arrived in Liberia in the early 1990s, with funding from Mennonite Central Committee and what is now called Mennonite Mission Network, both based in the United States. Hart trained Lutheran church workers who, in turn, trained Gbowee. Hart also arranged for Sam Gbaydee Doe, who became Gbowee’s friend and mentor, to earn a graduate degree in conflict transformation at EMU. In 1998 Doe became one of the earliest master’s degree graduates from what is now called the Center for Justice and Peacebuilding, setting the stage for Gbowee to earn the same degree nine years later. “We plant what we call ‘seeds of peace’ as widely as we possibly can, usually through education in peace building theory and skills, and then trust that some of these seeds will bear fruit,” he added. The woman Gbowee calls her “true friend” and fellow founder of Women, Peace and Security Network Africa, Thelma Ekiyor, attended EMU’s 2002 Summer Peacebuilding Institute, as did Gbowee’s first champion and employer in Liberia, Lutheran Reverend “BB” Colley, who attended the annual institute in 2000 and 2001. At Colley’s urging, Gbowee read “The Politics of Jesus” by the well-known Mennonite ethicist John Howard Yoder. Gbowee, who was named EMU’s Alumna of the Year in the spring of 2011, is the central figure in a documentary co-produced by Abigail Disney, “Pray the Devil Back to Hell.” Completed in 2008, the documentary is part of a “Women, War & Peace” series to be aired over five successive Tuesdays in October 2011 on public television stations in the United States. “WANEP, based in Ghana, emphasized using nonviolent strategies and encouraged women to join the effort to address problems of violence, war and human rights abuses,” wrote Gbowee. WANEP supported the launch of Women in Peacebuilding Network, the organization through which Gbowee and her colleagues conducted the campaigns that played a key role in ending the civil war in Liberia. (This organization is the predecessor to Gbowee’s current organization, Women, Peace and Security Network Africa.) The WANEP-launched women’s network—plus Women of Liberia Mass Action for Peace, the grassroots movement led by Gbowee—laid the groundwork for the election of fellow Nobel Laureate Ellen Johnson Sirleaf as president of Liberia, the first woman president of an African nation. WANEP is now led by Emmanuel Bombande of Ghana, a 2002 graduate of CJP. Gbowee’s memoir credits two of the founding professors of CJP, Hizkias Assefa and John Paul Lederach, with strongly influencing her through their writings and teachings. “As a direct result of this conference, we will be launching a women and peacebuilding program at our 2012 Summer Peacebuilding Institute,” says Lynn Roth, executive director of CJP. The announcement from EMU on the Nobel Peace Prize award can be found at emu.edu. It is wonderful to see how the peacebuilding witness and action is spreading through Africa and the entire world through the effective activities of Leymah Gbowee. Congratulations to Leymah! What a wonderful story. As a fellow West African I applaud all she has acccomplished. This gives me a greater push to accept my acceptance letter to EMU as a Freshman in the Fall of 2012-2013. We give all the glory to God. How wonderful to hear that Leymah’s award helped you to realize that EMU was “the place for you” to get a quality education WITH a social and spiritual grounding. Not everyone is on campus has an activist bent, but you will meet plenty of people determined to change the world for the better and willing to make sacrifices to do so. Spread the word! We look forward to welcoming you! I have been following up for BBC and VOA Kiswahili news about this year’s Nobel peace prize winners. I have been encouraged that these two just came as a replacement of our just fallen heroin Professor Wangari Maathai. I am especially encouraged to learn that the one international press has talked much about was an EMU grad and this is non other than Leymah Gbowee. Congratulation Gbowee. Keep making peacefull struggles for the sake of the Gospel of Jesus Christ!